Toes are meant to wiggle. You’ll never convince me otherwise. Traditional socks spend their days trying their best at suppressing my ability to wiggle. So, when I found the Injinji Socks, I was instantly curious. Made from a blend of merino wool, nylon, and spandex, the Midweight Crew socks certainly have the heart of a hiking sock, but how do they hold up? Comfy! These feel great on the feet. After getting over the initially odd sensation of having silky goodness between my toes, I found myself forgetting they were on my feet at all. Once they’re on (which take a little more convincing than a typical sock), they absolutely stay in place. The close fit holds snugly against not only the feet, but the toes as well. This gives them a sort of anchor point. Typically my socks loosen up as hike from moving around in the toe of my foot, but not here. Having the fabric weaving in and out of my toes provided a few benefits. It did a great job of eliminating what is normally a pocket of air between my toes, creating a cooler feel. The fabric also pulls moisture away from those normally sweaty curves around the meta-phalanges, providing an overall drier foot. Once my feet left my boot, the contoured toes allowed a nice cool breeze to flow through, without leaving me cold. I can’t stand a traditional sock on my feet once the boots drop off, but I found myself keeping these on for hours around camp. Lightweight, yet still protective enough to shield against blisters and abrasion. Wiggling is fun, and immensely satisfying when paired with a breeze. They do take some getting used to. I noticed the freedom of my toes for a few miles before devolving into something of a more familiar sensation. Initially, I developed some slight abrasions on the outside of my big toes. Mostly, this was just from getting used to my now free toe moving around at the nose of my boot. there is an adaptation period, but it’s minor. There are no supremely fluffy, thick models available for those burly treks with heavy weight packs. I’m waiting! This is the first time I’ve ever had fun with a sock. I find myself resisting the urge to run around camp in them, as sticks and stuff still hurt. Sadness. But, they make a great hiking sock. The freedom feels great, and makes traditional socks feel like a lazy attempt to avoid stitching toes into them. 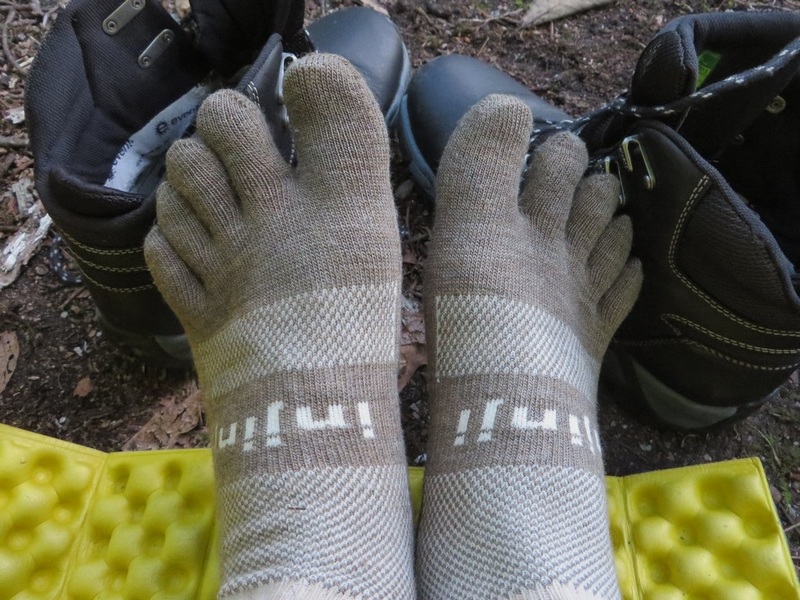 Around town or on the trail, I really enjoy the Injinji Midweight Crew (tested). They offer improved breath-ability, light weight, blister resistance, and above all, a great conversation piece. All for a solid price at just $20. Just give your feet some time to adapt. If you have any questions, contact us or leave a comment. We’re also on Twitter and Facebook (links to the right). For more information, check out their page below. Thanks for reading! Thanks to Injinji for providing some excellent socks to test. We certainly appreciate the support! A full disclosure is available on our contact us page. 3 season vs 4 season tent. What’s the difference?